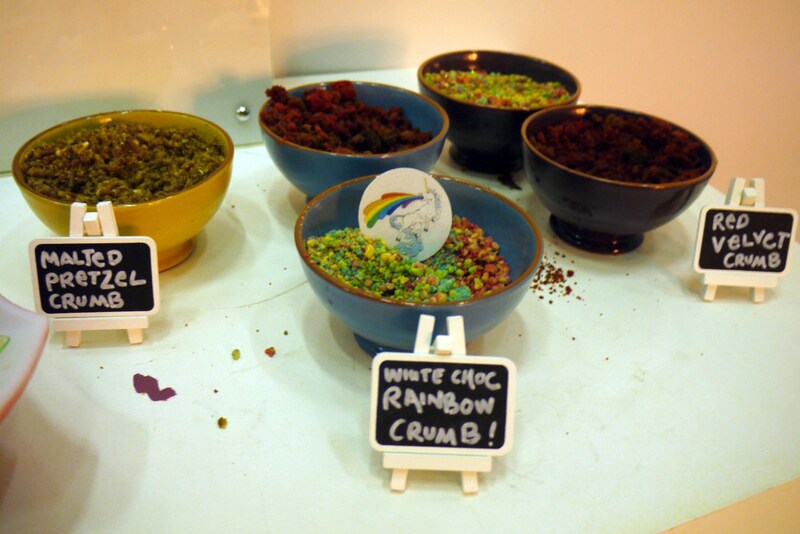 I’m a massive fan of Ginger’s Comfort Emporium and have been waiting in eager anticipation to hear more about their joint venture with Lush Brownies and Bakeorama called MilkJam. 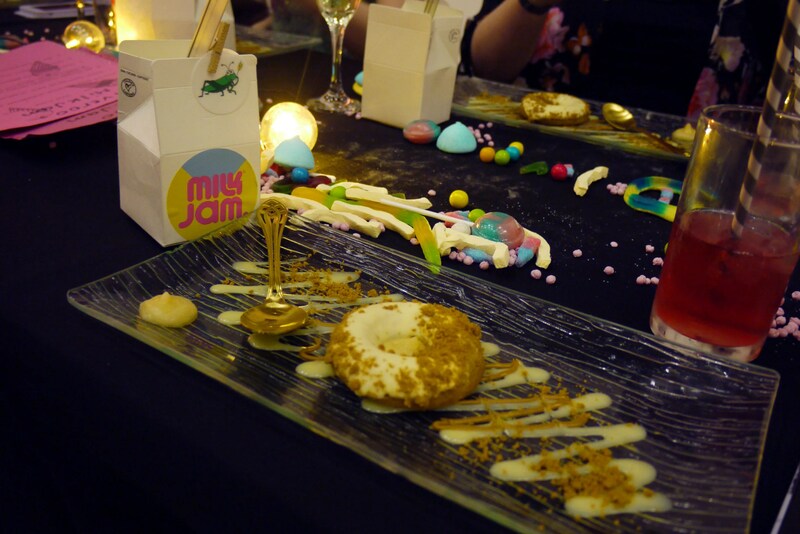 Whilst checking my social media feeds, I came across their launch event, the MilkJam x Deliveroo Pudding Club, which has six courses! I clicked the link and found it was £15 and there were two tickets remaining. A few clicks and I was a very happy owner of a ticket. 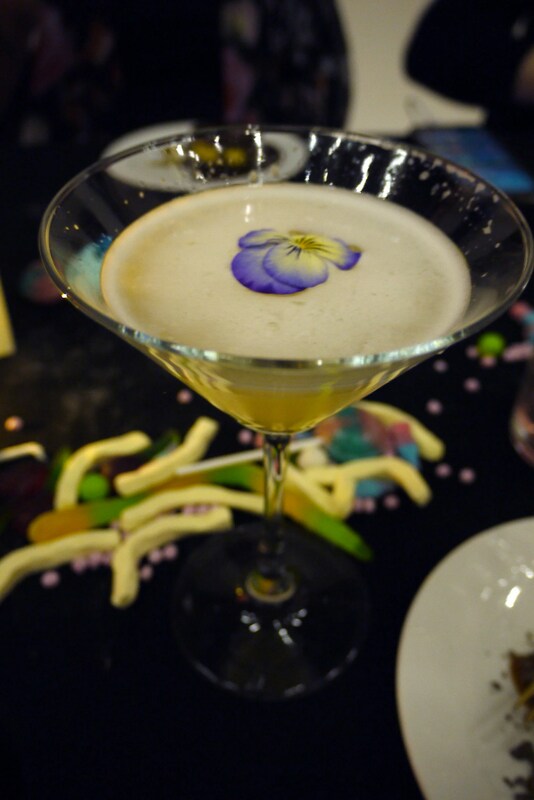 Cocktail maker Susie Wong was also present to provide cocktails for each course. 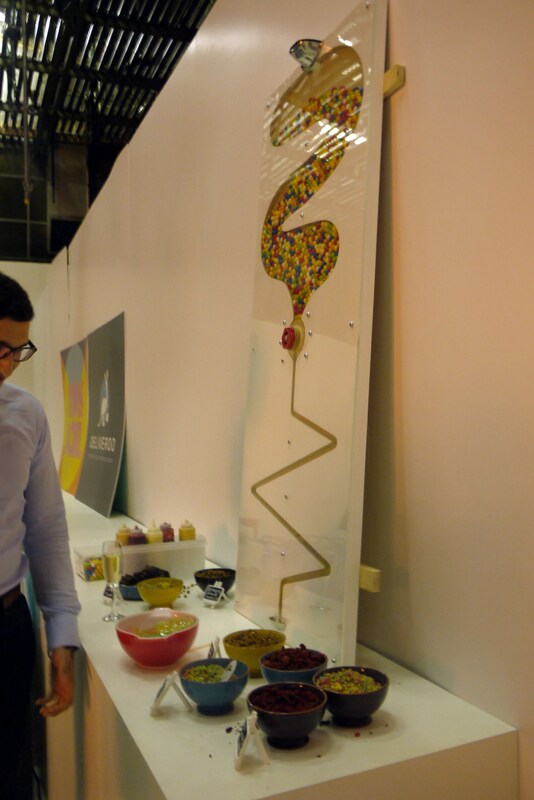 The launch event took place at the Old Granada Studios, right where the kitchens were being used to create magic! All opinions are my own. 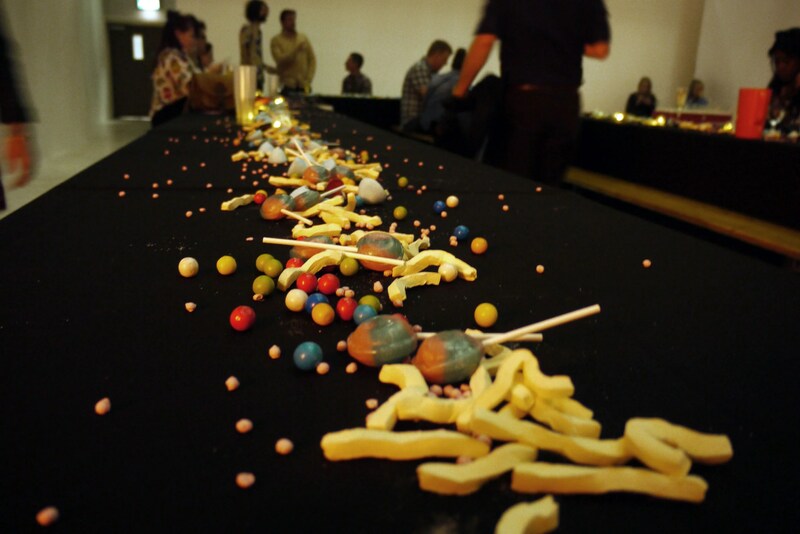 The bare bones of the Old Granada Studios doesn’t leave anything interesting to look at, but the people organising the event were creative in their table settings. 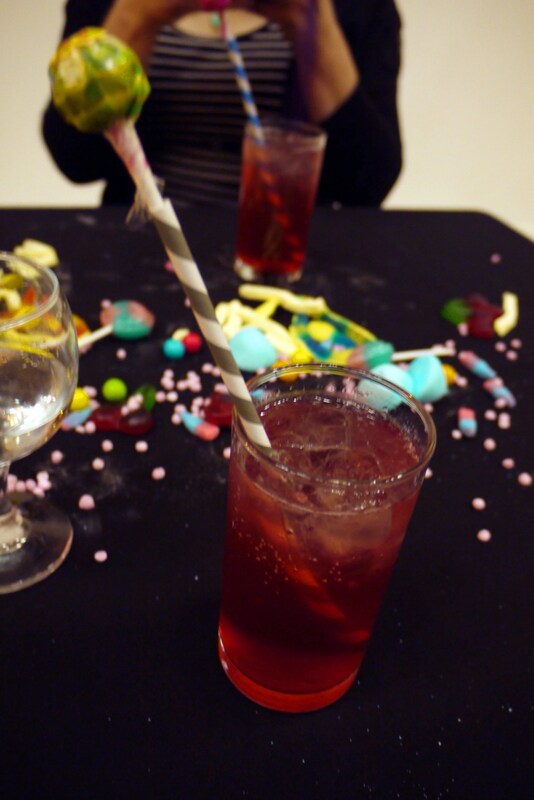 Retro sweets lined the middle of each table and we were greeted with a drink of our choosing from prosecco, wine or flavoured tonic water. I went with the last option, as I knew I’d be consuming a fair few cocktails later! There was already a queue for the first course as it was a DIY endeavour, so as soon as I secured a seat and set my stuff down, I went and joined it. 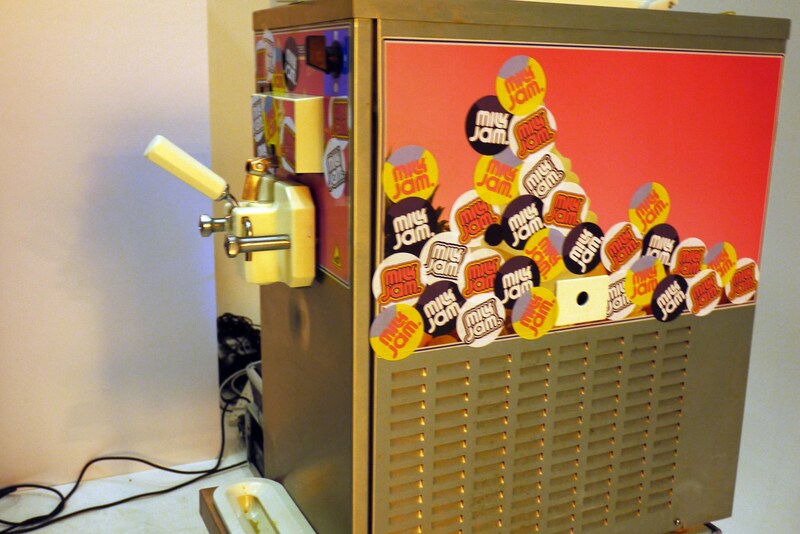 There were issues with the screwball machine jamming and the ice cream machine not functioning as it should, which was a shame as the flavours were nice. 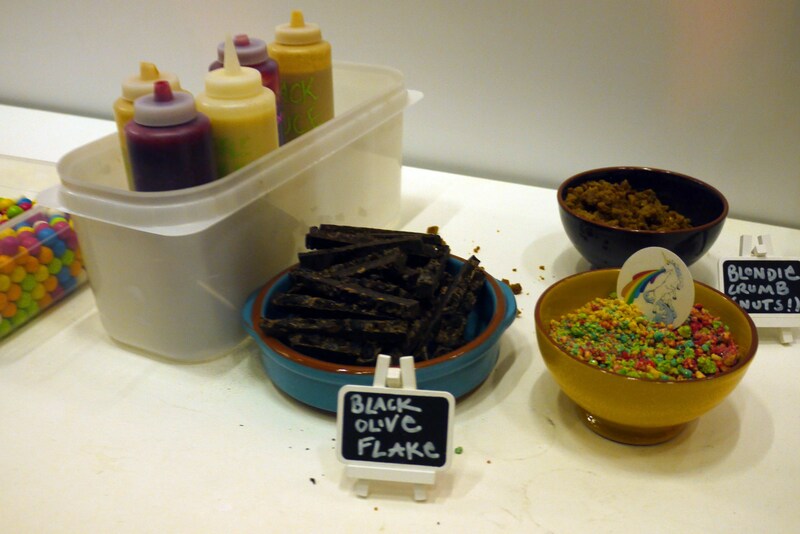 I especially enjoyed the black olive flake and if anything wished there were more mature flavours to accompany my screwball and malt ice cream. The Pomegranate and Basil Tonic Water by a company called Double Dutch was my non-alcoholic drink given to me on arrival. I really like how the basil adds a new dimension in conjunction with the pomegranate. I would happily try the other flavours in Doubt Dutch’s range! Cherry is my second favourite fruit flavour for desserts next to pear so I really enjoyed this cocktail. 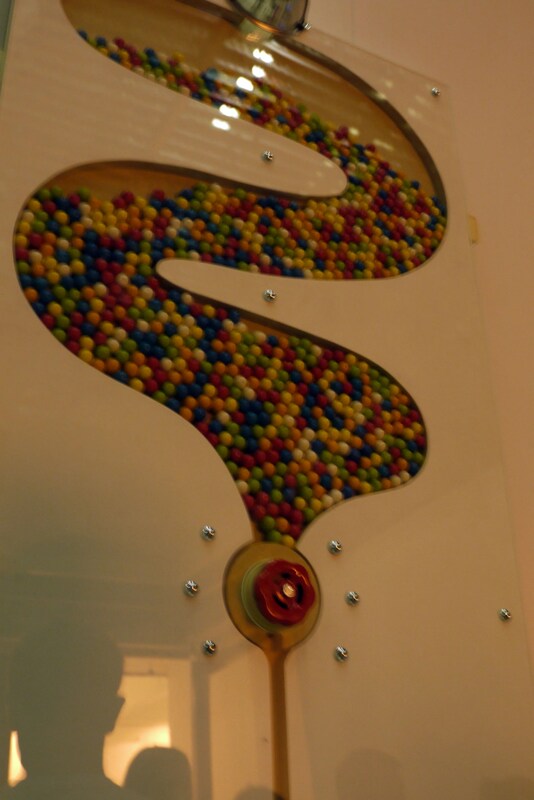 This would have paired really well with the sweeter toppings on offer. It was a very refreshing drink as the soda water and aloe vera dilutes the sweetness. 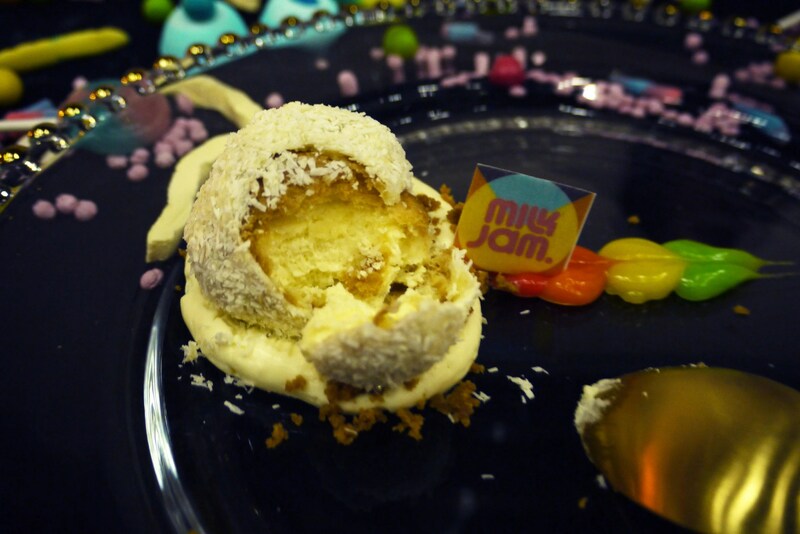 This doughnut… OMG… By far my favourite dessert from the entire evening. I knew I’d like it since it was flavoured with speculoos, but I didn’t know that I’d like it this much! Speculoos is the flavour you get in Lotus biscuits, otherwise known as biscoff. You can get this in a spread and Krispy Kreme also did used them! The spices worked well with the apple sauce and the doughnut had a nice bite which worked well with the creaminess of the white chocolate sauce. I will definitely be ordering this again! The grasshopper is a standard cocktail which consists of crème de menthe, crème de cacao and fresh cream. It tasted like mouthwash, but a tasty version of it. It was pleasant enough, but not something I can drink huge quantities of. I also don’t think this paired very well with the doughnut as it was minty. 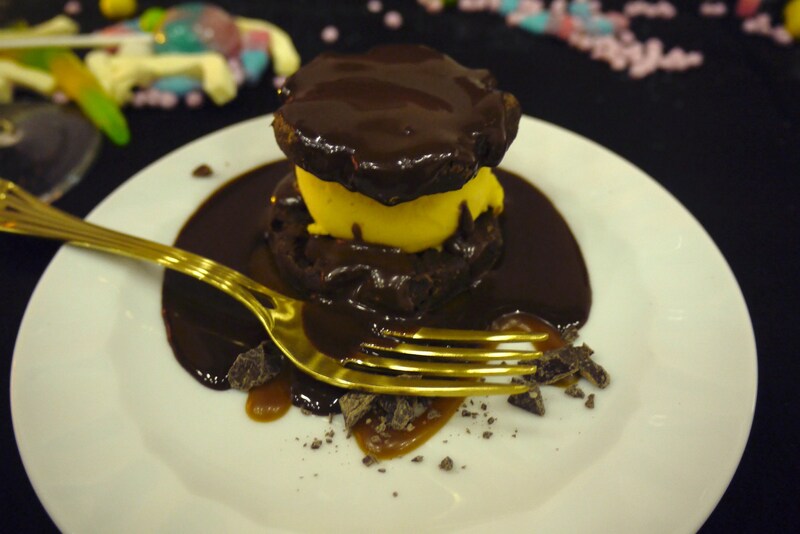 This was a double chocolate clementine brownie ice cream sandwich with a caramel puddle, sea salted chocolate crumble and served with a warm chocolate sauce. I really, really enjoyed this. It sounds like this would be overly rich, but this was not the case. The brownie and clementine ice cream were a match made in heaven and there was plenty of sauce. I believe once MilkJam opens, you can choose your own brownie and ice cream flavours from which to create your own ice cream sandwich! This was the perfect cocktail to pair with the brownie ice cream sandwich. The orange theme continues, although I didn’t drink much of this as the Cointreau was really strong. If there was less I’d probably finish this glass! I love profiteroles and I love cheesecake so I was intrigued by this combination. Turns out the profiterole part was only in the aesthetic but make no mistake, I loved this dessert! 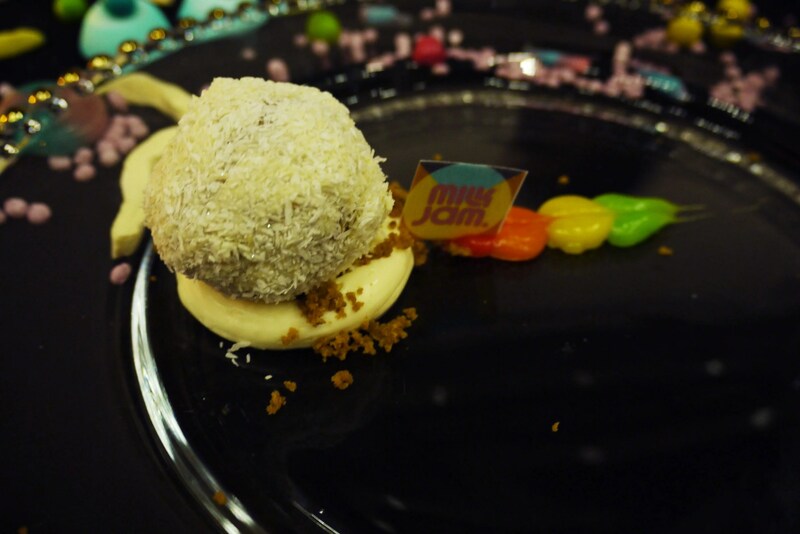 The outside is a shell made from digestives (or similar, essentially the bottom of a no-bake cheesecake), covered in coconut with the cheesecake part on the inside. I love cheesecakes so this was perfect, especially since the biscuity part was larger in comparison to the cheesecake part (which is my favourite part of a cheesecake). The rainbow lemon curd I found to be too tart, so I finished this without really touching it. 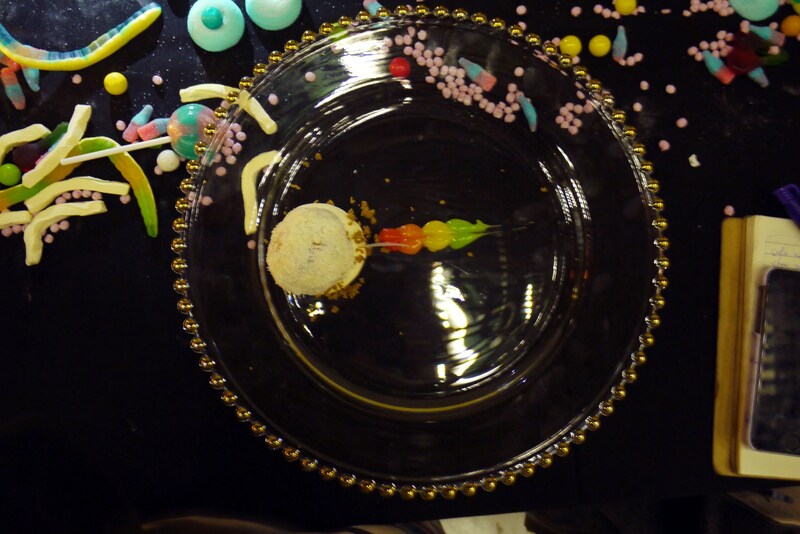 This dessert also came on the most amazing looking plate, but it was quite hefty in weight surprisingly! 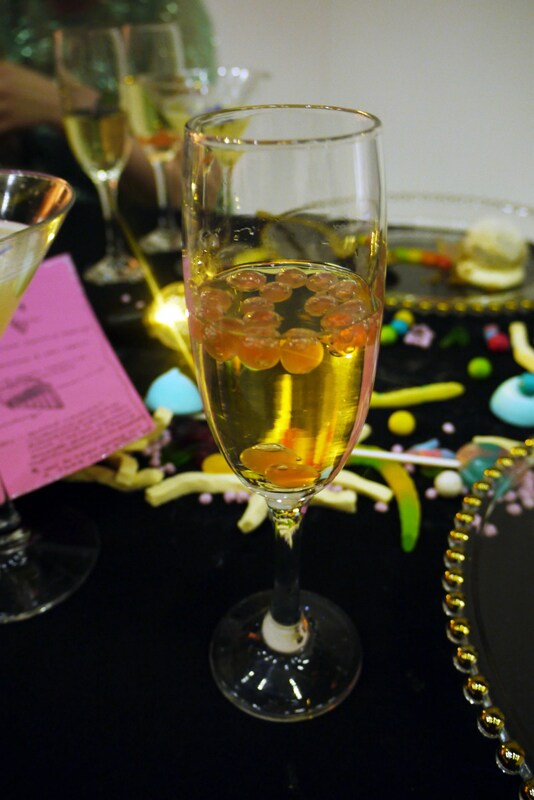 I loved the caviar bubbles, they remind me of the stuff you get inside bubble tea. 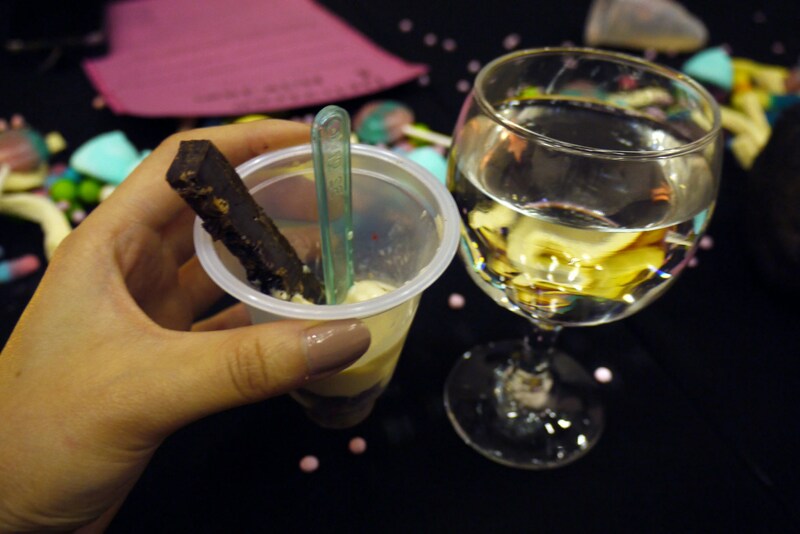 The prosecco was also very nice, I think this was my 2nd favourite drink from the evening! 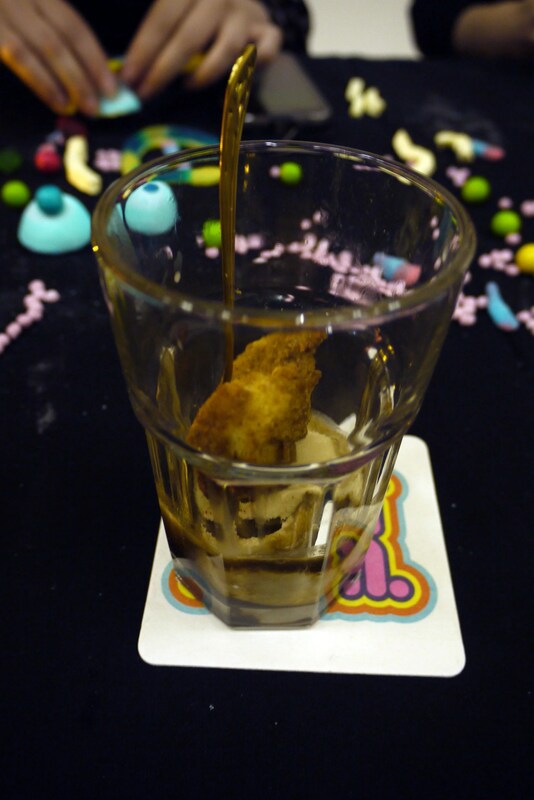 I was not overly fond of the ice cream, to be honest, but the scratchings were tasty and coated in sugary cinnamon. I ended up turning this on it’s head and treating the scratchings as the main part of the dessert and using the ice cream as a dip. This combination worked better for me. We were given a goodie bag containing the last course, 6 cubes of LushBrownies in the following flavours: salted caramel, cardamom pistachio, raspberry white chocolate, irish cream espresso, amaretto almond cherry, salted caramel pecan blondie. 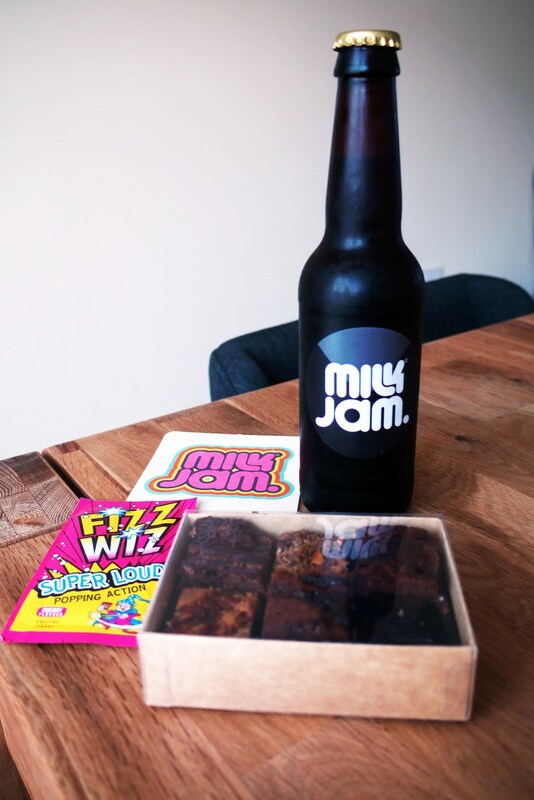 Also included was a MilkJam coaster, a sachet of cherry flavoured popping candy and a bottle of cold brew from Takk. I’m not fond of coffee so will probably give away the bottle. The brownies are delicious, albeit smaller than the portions you get from LushBrownies’ market stall. Still, 6 flavours! A good goodie bag! 8/10, -0.5 for not having more bitter tasting additions to the screwball. -0.5 for the overly tart lemon curd with the profiterole. -0.5 for the Grasshopper cocktail, I didn’t think it paired well with the doughnut. -0.5 for the large amounts of Cointreau in the cocktail paired with the brownie ice cream sandwich. Overall, though, the launch event was quite successful and MilkJam itself scored 9/10 if you disregard the pairing of the cocktails. 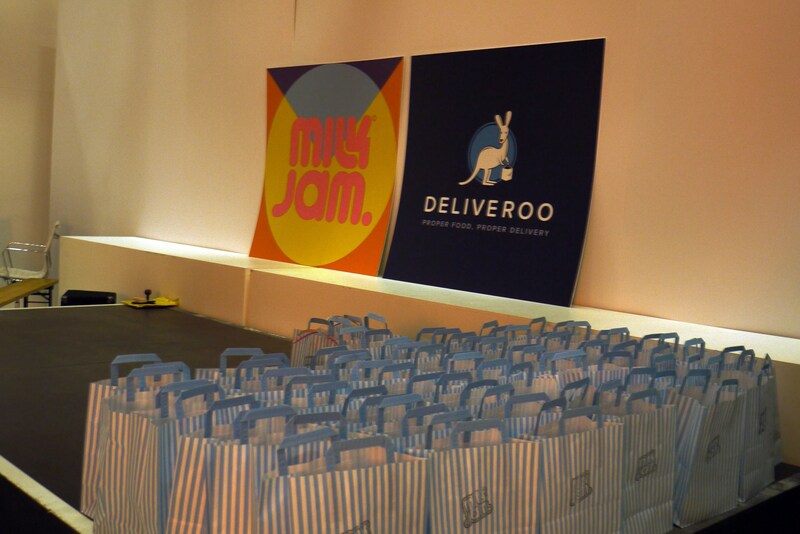 I’m quite excited for MilkJam’s endeavour and can’t wait for them to officially open in July! Are you excited about MilkJam? What do you think of the desserts on offer?